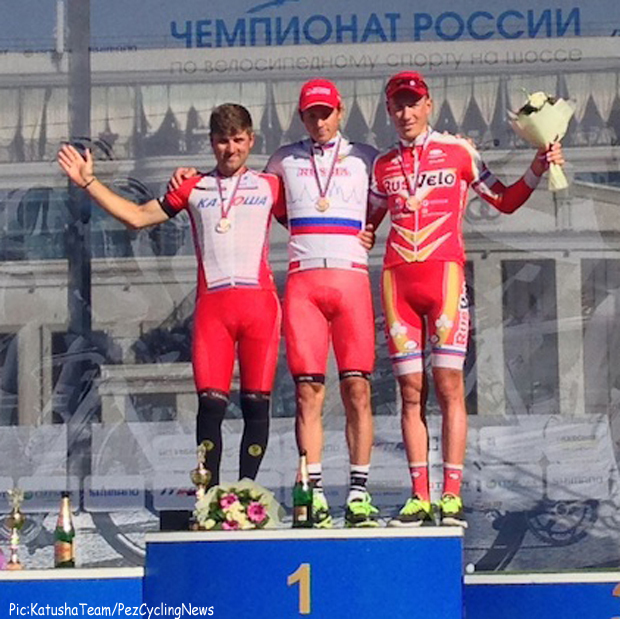 RusVelo rider Artur Ershov came in third in the 194 km-long elite road race on the final day of the Russian national championships held in the city of Tula 170 km south of Moscow. The race was decided in the last three kilometers. Artur had to counter three riders of Katusha; Alexander Porsev attacked on the downhill and crossed the line some 30 seconds earlier than his teammate, a multiple Russian champion Vladimir Gusev who finished just ahead of Ershov. Another RusVelo rider Ilnur Zakarin also made the top-10. The race was held on the same 13.8 km-long course around the city center as the rest of the road program – wide roads, hills (the overall vertical drop summed up to 1900 m). Yet the pros were far luckier with the weather than their younger colleagues and women, this time the sun shined in the blue skies, but the strong gusty wind was the principal factor that shaped up the scenario. 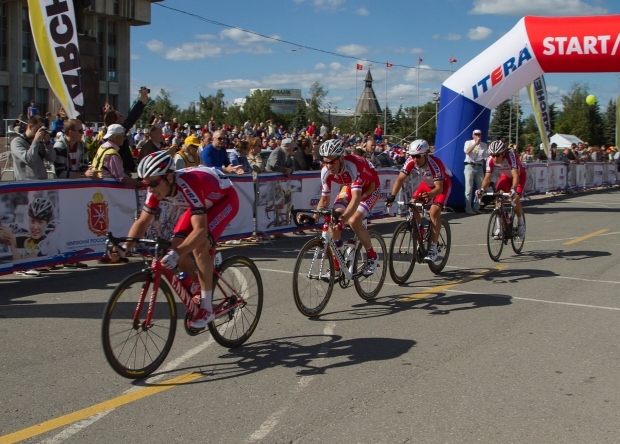 RusVelo spearheaded the attacks from the first kilometers, and the aggressive character of the event never changed. The riders covered almost 50 kilometers in the first hour, the peloton split and didn’t come together anymore. By the middle of the race, a very strong escape of 14 took shape, and the chances of the others to bridge the ever-increasing gap were withering away. There were 7 Katusha riders among the escapees and their four RusVelo’s counterparts: Ilnur Zakarin, Ivan Balykin, Sergey Lagutin and Artur Ershov. The latter initiated another powerful attack before a long downhill, Vladimir Gusev followed. Later on Alexander Porsev and Sergey Chernetsky succeeded in bridging over, and Porsev, the freshest one of four, converted it into the speedy two-kilometer surge to the line. “I’m happy or, let’s say, almost. In a situation like that it was hard to aim higher, when you’ve got three rivals of the same team around you. Moreover, by the final stretch I naturally wasn’t fresh anymore, being part of all the front groups of the day. The applied to Vladimir Gusev, so the newcomers who joined us made the things worse. It was an extremely hard race that left a lot of positive sensations: the team showed its fighting spirit, we didn’t let the World Tour riders dictate their terms at every corner; I’m also reasonably happy how I resisted it all till the end. I liked it here in Tula, the roads were superb, and the course turned out pretty selective”.